Sarees are known to enhance the beauty of Indian women. Ranging from 5-9 yards this long flowing drape, is the traditional wear of Indian and Bangladeshi women. Bangladesh like India creates a great variety of sarees which are admired by the whole world. The sarees of Bangladesh are mostly named after the villages and town of Bangladesh from where they originate. The Sarees of Bangladesh originated from mainly five different villages with its own distinctive style, namely Muslin, Jamdani, Tangail, Rajshahi, Tassar and Mirpur Bridal sarees. Muslin is a delicate feathery fabric, which is finely woven in full white. It is named after Mosul in present Iraq, the city through which the fabric was exported from Middle East to Europe in the 17th century. Interestingly, the true origin of this fabric was in Bangladesh and certain parts of West Bengal in Eastern India. This fabric was created for the first time during Mughal rule, which was so refined, that only Queens and rich women wore these 6 yards of smooth sarees capable of passing through a ring. The British destroyed this art during their rule in a bid to stifle the widely popular muslin. However, Indian scientists revived the secret of making muslin in the recent years initiating Muslin production again. Now, weavers from Bangladesh as well as parts of eastern India have stated making Muslin Sarees as their forefathers made hundreds of years ago. Jamdani is one of the most expensive sarees produced by Bangladesh, as the work involved in it is quite dedicated and lengthy. These sarees are characterized by a see-through look, and unique, artistic and intricate handiwork of the weavers (tanti), makes it a favorite choice among today’s fashion conscious working women and international aristocrats. This tradition is over 2000 years old and includes exquisite patterns that are mostly floral, plant or geometry based. The various names of Jamdani Saree patterns are butidar, panna hajar, jalar, dubli lala, tersa, duria, charkona and many others. Small flowers weaved on the fabric is known as Butidar, whereas these design in reclining position is known as Tersa Jamdani. Modern designs of Jamdani include works of rose, lotus, Jasmine, sago, bunch of bananans, and bunch of ginger. Apart from sarees, Jamdani is used to make handkerchief and scarves too. 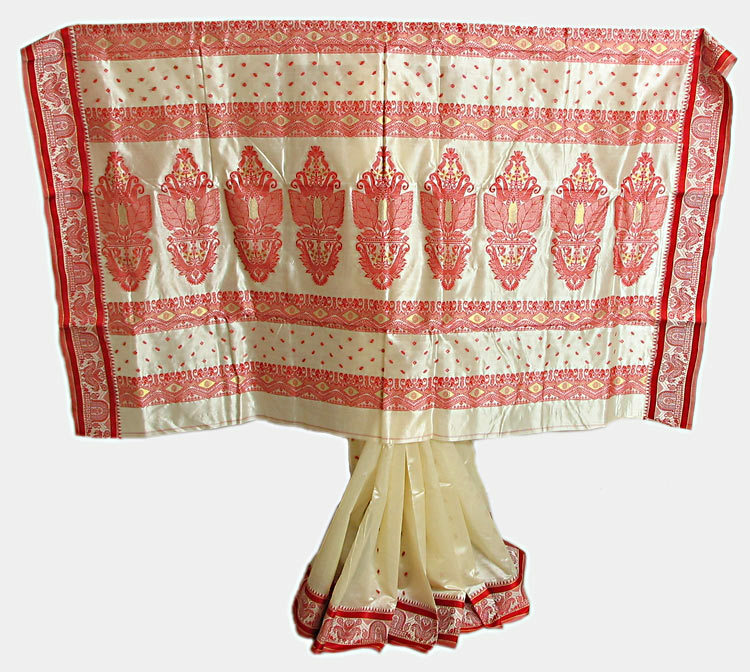 Tangail sarees are a simple version of the Jamdani Technique, where the paar (pallu) has spectacular embroidery of “paddo” (lotus), “pradeep” (lamp), combined with the authentic “lata-pata”(vine) pattern and others. Often single and multiple colors are woven into the paar (pallu) to create the “meekari” effect. Where Jamdanis stand for sophistication, Tangail stands for gorgeous bridal sarees in affordable price range. These include sarees good for “gaye holud” (haldi) and “mehendi” occasions where Jamdani motifs are woven on Tangail fabric resulting in a wonderful mix of Tangail Jamdhani. This is one of the finest and most delicate fabrics, produced in Rajshahi, Bangladesh and quite renowned in the world of sarees. This supple fiber is produced from shells of silkworms, which is covered with a protein called Sericin. There are three types of Rajshahi Silk – Mulberry, Eri (or Endi), and Tassar. Among these it is Mulberry that is most valuable as by quality it is the best. Rajshahi fabric and its products are quite desirable in Bangladesh, India as well as across the globe. Mirpur Silks are an invariably matchless choice in case of wedding ceremonies. The best remarkable bridal sarees are Mirpur Benarasee, katan or silk from Mirpur Benarasee Polli. Originally apart form Mirpur in Bangladesh; these sarees are also manufactured in Varanasi in Uttar Pradesh, Bihar and a small number in Pakistan. Gaudy sarees with primitive ornamentation and striking colors makes the sarees suit ideally to the occasion of marriage. The warp is pure fine silk mixed with metallic strings and silk. 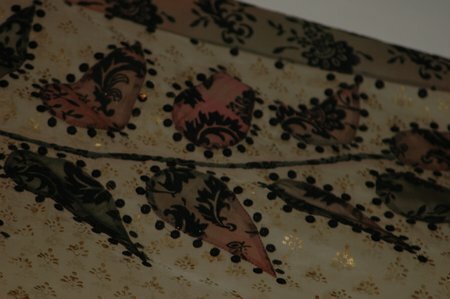 Interestingly the elaborate work on the Mirpur silk is done on the basis of a gender differentiation, where the men weave and the women embroiders on the woven silk. These are some of the famous sarees from Bangladesh, whose popularity is not only limited to Bangladesh but is appreciated throughout the world. This is an excellent piece of information on traditional sarees of Bangladesh. I always wanted to know more about these items and now i do! Thankyou. Would i be able to purchase any of these on-line? Kindly visit our website http://www.sareez.com for different varieties and prices of Tangail sarees. I would be grateful if you would let me know if i am able to buy any of the popular types of sarees of Bangladesh on-line? and how? Thankyou.